1. Participants should be a Filipino citizen or a Philippine Passport holder. 1. Completed PDF Document of the Entry Form: Synopsis, Treatment, Director's Intention, and rough outline of the production budget, list of filmmaking tools they’ll be bringing during the 24-hour challenge. 2. Proponent’s Scanned copy of passport / any government-issued ID (1) and/or scanned copy of school ID. 4. All submissions must be done online. 6. Preferences must be cited properly and with permission. The partnership hopes to raise the values of national pride, encourage common good and foster cultural awareness and creativity. 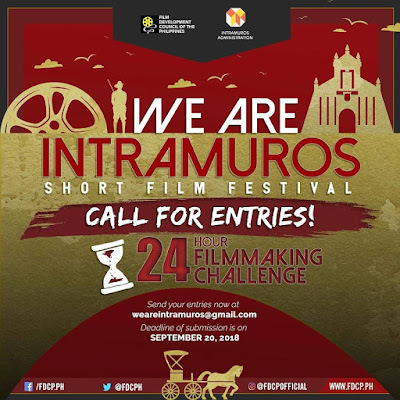 Deadline of submission of entries is on September 20, 2018. For more details, like and follow the FDCP social media accounts on Instagram, Twitter and Facebook page.